"The most prestigious Prize awarded to a lawyer in Europe"
The "Ludovic-Trarieux Human Right award" is the oldest and most prestigious award given to a lawyer in the world, commemorating the memory of the French lawyer, Ludovic Trarieux (1840-1904), who in the midst of the Dreyfus Affair, in France, in 1898, founded the " League for the Defence of Human Rights and the Citizen " ", which is at the basis of all leagues set up in the world and on the same model since then. Created in 1984, in Bordeaux by President Bertrand FAVREAU, the Prize is awarded each year to a lawyer, regardless of nationality or Bar, who, by his work, will have illustrated his activity or his suffering, the defence of human rights, of defence rights, the supremacy of law, the struggle against racism and intolerance in any form, after consulting humanitarian associations and NGO. 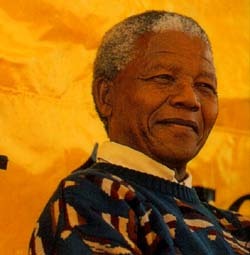 The first " LUDOVIC TRARIEUX PRIZE " was awarded on March 29th 1985 to Nelson MANDELA, then in jail. On February 11th 1990, Nelson MANDELA was released. Since then, it has been decided to award the Prize. The Prize awarded each year in partnership by the Human Rights Institute of The Bar of Bordeaux, the Human Rights Institute of the Bar of Paris, the Human Rights Institute of The Bar of Brussels, l'Unione forense per la tutela dei diritti dell'uomo (Roma) and the European Bar Human Rights Institute (IDHAE) whose members are the biggest european law societies fighting for human rights such as Rechtsanwaltskamme Berlin, Ordre français des Avocats du barreau de Bruxelles, barreau de Luxembourg or Polish National Council of the Bar (Warsaw). It is presented every year in a city that is home to one of the member Institutes. Following the Prize award to Nelson Mandela in 1985 and the decision in 1990, after he has been released, the Prize to be awarded every 2 years, the next winner in 1992 was the Peruvian lawyer Augusto ZÚÑIGA PAZ, who has dedicated his life working for the support of the Human Rights in the COMISEDH (Comision de Derechos Humanos ) and because of that he had also lost his left arm in an explosion. In 1994 the Prize winner was Jadranka CIGELJ, a Bosnian Catholic , who due to her activities she was among the "group" of the intellectuals who were detained, violated and tortured by the other Party in the civil war in Former-Yugoslavia. After Nelson MANDELA, in 1985, Najib HOSNI was the second prize-winner. While in detention. 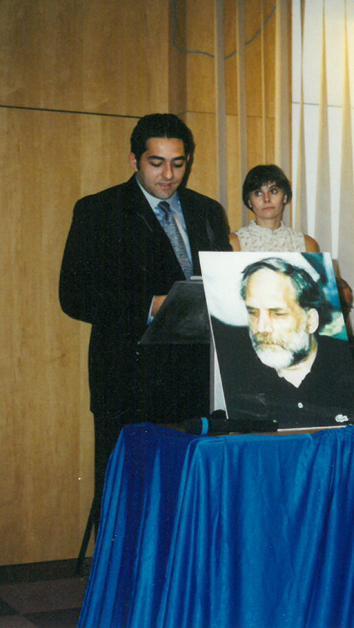 Nejib HOSNI was released by special presidential pardon by President Ben ALI on December 14th 1996, three months after the ceremony award in Bordeaux where the prize had been handed over to his representative, Dr Helen JAFFE, President of AVRE. The fifth Prize was awarded on May 25th 1998, to the Chinese lawyer ZHOU Guoqiang. After Nelson MANDELA and Nejib HOSNI, ZHOU Guoqiang was the third prizewinner not able to come to France in order to receive his Prize, as stipulated by the rules of the Prize. Because of the risks to his family and to himself, and notably that of being forced into exile, like many other Chinese dissidents prevented from going back to China if he left the territory to come and receive his Prize in France, ZHOU Guoqiang had no other choice but to mandate Mr. LIU Qing, Chairman of HUMAN RIGHTS in CHINA, who has been living in exile in New York since 1991, to go and receive the Prize in his name. 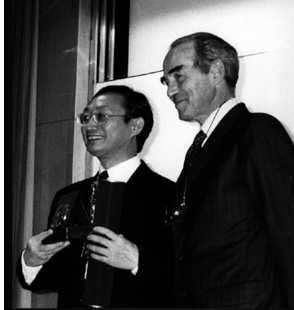 Thus, the reward was given to him by M. Robert BADINTER on Friday 2nd October 1998 in the amphitheater of the National school of Judiciary (Ecole Nationale de la Magistrature) in Bordeaux and on that occasion Mr LIU Qing read the speech written by ZHOU Guoqiang for the Ceremony award. 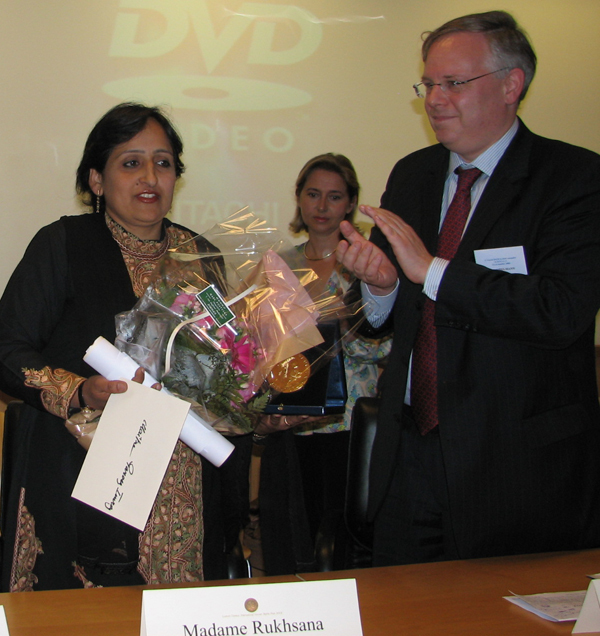 On May 23 2002, the jury of " Ludovic Trarieux International Human Rights Prize " awarded the Prize 2002 to the iranian lawyer Mehrangiz KAR, a human rights lawyer, writer, essayist, and former editor of the now-banned Zan literary review whose work as an activist for women's rights often put her in conflict with Iranian authorities. The Award was given on October 24 2002, by the First Judge of the French Court of Cassation Mr Guy CANIVET during a Ceremony in the House of Lawyers in Paris in presence of 200 lawyers from France and main countries of Europe . 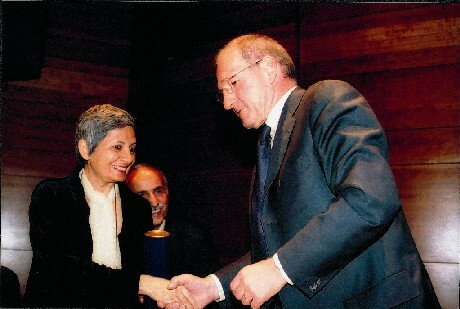 ( Ceremony award of the 2002 Prize to Mehrangiz Kar). 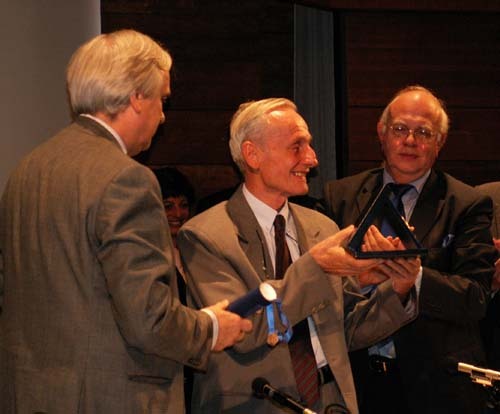 On June 13, 2003 the 21 European lawyers members of the Jury of the "LUDOVIC-TRARIEUX INTERNATIONAL HUMAN RIGHTS PRIZE 2003" meeting in Brussels Court's House, awarded the eighth " Ludovic-Trarieux " 2003 jointly to . Digna Ochoa y Plácido (post mortem) and to Bárbara Zamora Lopez. The Jury called the Mexican authorities to ensure an effective, independent and thorough investigation into the killing of Digna Ochoa and expressed deep concern for the safety of Barbara Zamora and urged to give her immediately an appropriate protection. The Prize was presented on October 3rd , 2003, in the Main Hall of the National School of the Judiciary of France in Bordeaux to Jesus Ochoa y plácido, brither of Digna Ochoa and to Bárbara Zamora by Jean Cruyplants, Chairman of the Brussels Bar Association. More : The Ceremony Award 2003. The 21 European lawyers members of the Jury* of the "LUDOVIC-TRARIEUX INTERNATIONAL HUMAN RIGHTS PRIZE " meeting in Paris House of Lawyers, on on April 26th 2004 awarded the nineth " Ludovic-Trarieux " Prize to Aktham Naisse (written also Nu'aysa), 53 year old, a human rights defender and lawyer, chairman of the Committee for the Defence of Democratic Liberties and Human Rights in Syria (CDF), and Vice President of the Arab Commission for Human Rights, because of his struggle for human rights in Syria At the risk of his own liberty. Aktham Naisse presented the Prize in Brussels on October 8th from the hands of Court of Cassation highest Judge, Premier President Michel Lahousse in the main hearing room of the Court in the Law Courts' of Brussels (Belgium). Following an international campaign, the Supreme State Security Court dropped the charges against Aktham Naisse on April, 26, 2005. The Jury of the "LUDOVIC-TRARIEUX INTERNATIONAL HUMAN RIGHTS PRIZE » meeting in Brussels Court’s House, on Friday 2 June 2006 awarded the eleventh « Ludovic-Trarieux » Prize to Parvez Imroz, a human rights lawyer and a civil rights activist in Srinagar, the capital of Jammu and Kashmir, who, since the end of the eighties, has initiated and led campaigns for human rights in a context of grave violations, including killings, tortures and rapes, or forced "disappearances" with impunity . Parvez Imroz is also founder and President of the J&K Coalition of Civil Society (JKCCS) that works to build local alliances between Kashmiri civil society groups. The 12th “LUDOVIC-TRARIEUX INTERNATIONAL HUMAN RIGHTS PRIZE “ for 2007 was awarded on May 11th 2007 to Cuban lawyer René Gómez Manzano , 63 years-old, who created the "Corriente Agramontista de Abogados Cubanos", an independent professional organization of lawyers in Cuba, that seeks to reform Cuba’s judicial system from within by requiring the Cuban government to obey its own laws and will to litigate political cases against the state. Mr. Gomez Manzano petitioned Cuban immigration authorities to grant him the "permission"to attend the award ceremony . but Cuban authorities haven't authorized René Gómez Manzano, to attend the ceremony held in his honor in Brussels, to receive the award. René Gómez Manzano gave mandate to three exiliated Cuban lawyers members of "Corriente Agramontista", Juan ESCANDELL RAMIREZ, Luis FERNANDEZ et Pedro FUENTES CID, in order to receive all together the Award on behalf of him. Lawyer U Aye Myint and eight other persons arrested on 17 July 2003 by members of the Military Intelligence was sentenced to death for having contacts with political organizations in exile partly on the basis that he had communicated with the ILO. After pressure by International Labour Organisation (ILO), the death sentence was commuted to three years’ imprisonment, for treason. U Aye Myint was released in January 2005. In 2005, U Aye Myint was re-arrested and sentenced to seven years' imprisonment allegedly for helping farmers report to the authorities and the ILO that local officials had confiscated their land. Because of his conviction, government authorities acted on 13 May 2006 to strip him of his licence to practice law and ensured his dismissal from the Bar Council, in contravention to Council regulations.The ILO made the release of Aye Myint an explicit condition of continued cooperation with Burma, and set a deadline for his release. 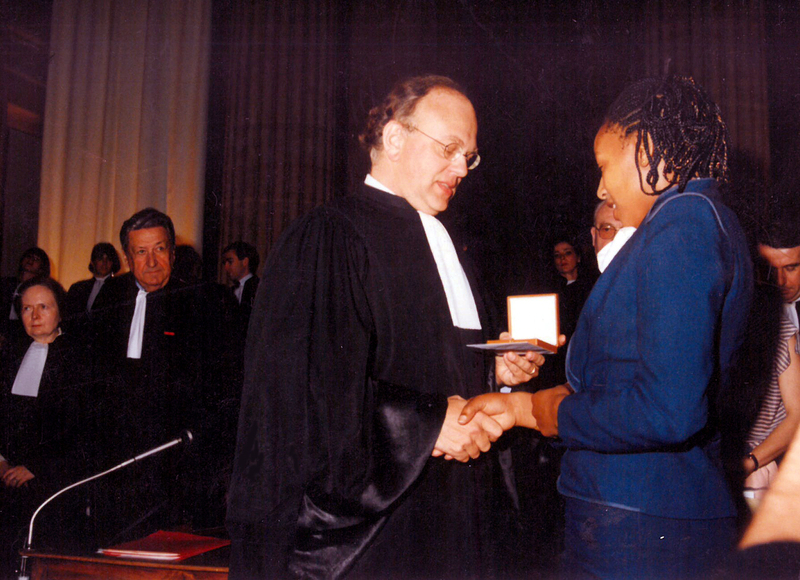 The fourteenth "LUDOVIC-TRARIEUX INTERNATIONAL HUMAN RIGHTS PRIZE » 2009 was be presented to Beatrice Mtetwa, immediate past president of the Law Society of Zimbabwe for for her trailblazing role in defending freedom of peaceful assembly , of association and freedom of speech and the rule of law in Zimbabwe at the Bar Association in Paris, on October 29th 2009 by Mr Gérard LARCHER, President of the Sénat (the upper house of the bicameral French Parliament). The 2010 International Human Rights Prize Ludovic Trarieux “The award given by lawyers to a lawyer”.was presented to Karinna MOSKALENKO (RUSSIA) on Friday 8 October 2010 in the Library of Montesquieu at Chateau de La Brède, near Bordeaux, during a ceremony during which the representatives of the European Bars of Berlin, Brussels, Luxemburg, Rome, Paris pâyed tribute to the lawyer who had not hesitated, in the face of bullying and insults, or even more serious risks, had known his colleagues who were reluctant to defend human rights to systematic recourse to the peaceful weapon that is European and international law. Karinna MOSKALENKO dedicated her prize to all the brave advocates of the Center for International Protection, which she created in 1994 and which is dedicated to the defense of detainees in Russian prisons and enforced disappearances in Chechnya. She said that those who wanted to eradicate human rights violations in Russia were the real Russian patriots, and called for new hope. 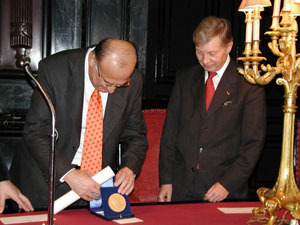 The award was presented on 1st December 2011 in Brussels by Viviane REDING, Vice president of European Union, commissioner for Justice, Fundamental Rights and Citizenship to Fethi Terbil, 41 years-old, is a Libyan lawyer and human rights activist in the Main Room of the Belgian Cour de Cassation in Brussels. Fathi Terbil's arrest in February 2011 sparked a demonstration in Benghazi on 15 February by around 200 relatives of the deceased prisoners, which began the 2011 Libyan protests. The protests reportedly began after the arrest of Fathi Terbil who represents relatives of more than 1,000 prisoners allegedly massacred by security forces in Tripoli's Abu Salim jail in 1996. The Ludovic-Trarieux International Human Rights Prize 2012 was presented by Mrs Sabine Leutheusser-Schnarrenberger, Bundesminister der Justiz, on November, 30th 2012 in Berlind'audience de la Cour d'Appel à BERLIN. Muharrem Erbey, a kurd lawyer, Vice President of Insan Haklari Dernegi – IHD –, one of Turkey’s most reputable human rights associations. He is also President of the Diyabakir Branch of the IHD, was in pre-trial detention since his arrest in December 2009 in Diyabakir. The Prize was presented in abstentia to his wife. Muharrem ERBEY was freed on April, 12 2014. The 18th Ludovic-Trarieux International Human Rights Prize was awarded, by the Jury, on June 20th, 2013,in Geneva, to lawyer from Kazakhstan, Vadim Kuramshin. Vadim Kuramshin was arrested right after coming back from an OSCE conference in Warsaw in September 2012, during which he presented a speech denouncing human rights abuses in Kazakhstan He was sentenced to 12 years in prison on December 7, 2012 on charges of blackmailing the assistant of the district attorney. The trial has been widely reported as not conforming with international standards. The Prize will was officially presented on December 5th, 2013 in Paris to Kuramshin’s mother, Olga Koltunova by Christiane Féral-Schuhl, President of the Paris Bar Association in la Maison Barreau de Paris. The XXth "Ludovic-Trarieux" Human Rights International was awarded to Waleed Abu ql-Khair is the founder of the Monitor of Human Rights inSaudi Arabia (MHRSA) who has long campaigned for reforms . He was handed a 15-year sentence on six charges by a specialized court in connection with his work. He represented his brother-in-law prominent blogger Badawi who has been jailed for 10 years and sentenced to 1,000 lashes for insulting Islam. The Prize 2015 was presented in a Ceremony in the Geneva Courthouse on November 27 th 2015 by the president of Geneva Bar Association, Jean-Marc CARNICÉ, to Dan Arschack, an attorney member of the New York and London Bar Associations, present on behalf of Waleed Abu al-Khair. The award ceremony of the XXIInd Ludovic-Trarieux International-Human Rights Prize 2017 awarded to Mohammed Al-Roken (United Arab Emirates), took place on November 10th , 2017 in the Venetian Institute for Science, Arts and Letters, Palazzo Franchetti, Venice (Italy) under presidency of Mrs Annamaria MARIN, Presidente della Camera Penale Veneziana. Since Mohammed Al-Roken, who is serving a ten-year sentence in the (UAE), was unable to accept the prestigious award, Mohammed Al-Saqer, a colleague from the now-dissolved Association of Jurists, who was himself sentenced to five years in prison in absentia, accepted it on his behalf. Prize was presented in abstentia to Mohammed Al-Saqer by Mrs Annamaria MARIN and Mr Bertrand FAVREAU, chairman of the Jury. The Prizewinner received special tribute coming from main European Bars, Unione Forense per la Tutela degli Diritti Umani and Union Internationale des Avocats (UIA).